Whether you're sharing your latest blog or one of your followers is giving it a shout out, you want every share to be visually appealing and have the best chance of being reshared. To do that, it's crucial that you format your website's meta data for optimal social shares on Facebook and Twitter. That way, no matter where or how your posts get shared, they'll always look great! Dealing with meta tags may sound intimidating, but it's really pretty simple. And most of the time, you can use a plugin to do this automatically. So, once you set up the plugin, you don't have to worry about it again. 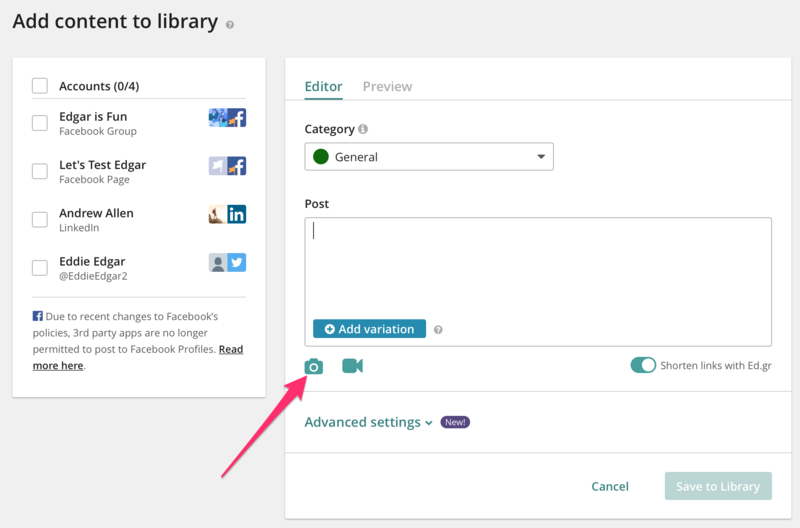 To upload an image to your Edgar posts, click the camera button on the Add New Content page. You can upload any valid GIF, PNG, or JPEG to Edgar (but keep in mind that GIF files will post as static images on Facebook and LinkedIn). The maximum file size is 3MB. Can I add more than one image to a post? Yes! You can upload a maximum of 4 images for Twitter, 20 images for Facebook, or 10 images for Instagram. Edgar does not post multiple images to LinkedIn. All images added to a post will be published with every variation of that post. Images apply to the entire post rather than to individual variations at this time. For Instagram, you will choose the order of the images when you receive the push notification at the time of the post. Edgar publishes videos to Facebook, Instagram, and Twitter. Only one video may be uploaded to a post at this time and will be published for all variations of that post. Edgar cannot post video to LinkedIn at this time, but it's on our roadmap for future improvements! 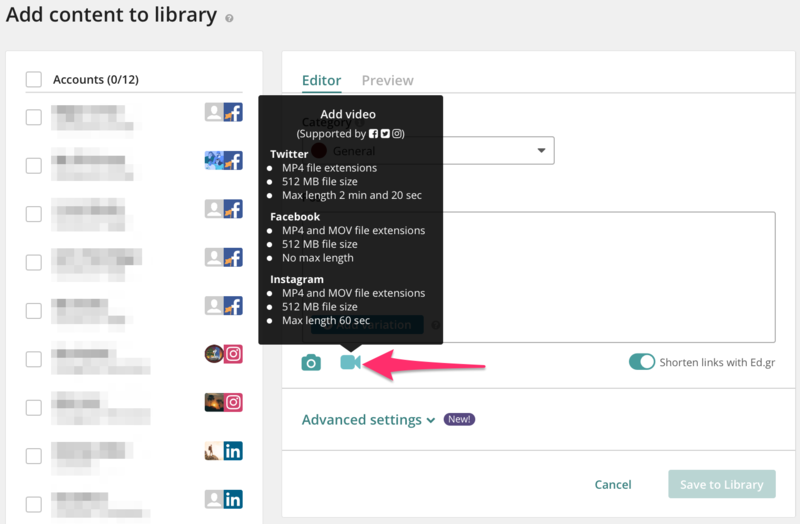 *Note: You may upload a maximum of 500GB worth of videos to your Edgar account at this time.